Is he the worst developer in Arizona? If it’s three strikes, you¹re out, then Scottsdale developer George H. Johnson has struck out, leading the league with the dubious distinction of one of Arizona’s most rogue developers. It’s a pretty outrageous title in a state known for bad developers, but both state and federal officials say he stands above them all. In December, the State of Arizona ­ where an unprecedented five state agencies were suing him ­ settled with Johnson for a record repayment for despoiling state land, damaging a southern Arizona river and creating havoc in one of America¹s newest national monuments. Although the settlement includes the caveat that Johnson makes no admission of liability, it also provides that he repay the state agencies $7 million. Earlier, the bulldozer company he hired, 3F Contracting Inc., agreed to settle for $5.05 million, making this $12.05 million settlement the largest civil environmental recovery by state agencies in the history of Arizona, officials say. But this wasn’t the first time, or even the second, but the third time Johnson has made state history by paying the largest fines ever assessed against a developer. And his troubles aren’t over yet. The Environmental Protection Agency has a massive lawsuit against him that stands out for the enormity of what it charges he did to the Santa Cruz River. Just what in the world did this developer do to bring such heavy weights down on his head? In a blog he’s been writing for two years called The Johnson Report, Johnson asserts his innocence and contends officials have targeted him unfairly. He says Arizona media have portrayed him in a bad light, making him out to be a monster that he’s not. It’s as if Atilla (sic) the Hun were let loose upon Arizona, he writes. Officials say developer George Johnson has done the most dastardly things to Arizona. They say he trespassed on state and federal land ­ including land in one of America’s newest national monuments ­ and bulldozed some 270 acres without permission. They call it moonscaping, saying his work resembles the aftermath of a nuclear blast or looks like an unpaved parking lot. They say that without any of the required permits, he did the same thing to another 2,000 acres, which he first claimed to be ranching then said he was using it to build the state’s eighth largest city with some 67,000 homes for 175,000 people. They say he caused irreparable damage to seven archeological sites on state trust lands owned by the people of Arizona, including more than one­third of a 110­acre Hohokam Village that was active from 750 to 1250 A.D. They say he polluted and diverted the Santa Cruz River, wiping out a wetland area for the endangered pigmy owl and causing flooding on Indian land downstream. They say he caused the injuries and deaths of at least 21 protected Arizona desert bighorn sheep in a bizarre attempt at farming that proved he didn’t know the difference between cattle pens and pens for much smaller goats (the sick animals escaped and invaded a national preserve, causing havoc in Arizona’s largest bighorn herd). All of this happened in southern Arizona near the small town of Marana. But no matter how small the town, it happened in a state where few people ­ especially a developer who’s been in business more than 30 years ­ can claim ignorance of Arizona’s efforts to protect the desert. The state says Johnson may have bulldozed thousands of saguaro cactuses without acquiring a single permit to move the plants (each saguaro carries a $10,000 fine per plant for being uprooted). 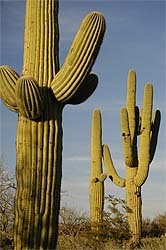 Even a popular children’s book, Deserts, by Nancy Castaldo, notes spells out that this is a no-no: Efforts to protect saguaro cacti and other native plants from collecting and damage have led to laws in Arizona that require individuals to obtain a permit from the state to remove or relocate any native plant on their property. This even holds true for property owners who want to move a cactus from one end of their property to the other. The land, called La Osa Ranch, is part of a national plan to preserve habitat while accommodating development called the Sonoran Desert Conservation Plan. Officials for several Arizona oversight agencies were so disgusted with what they say Johnson did, that in February 2005, Attorney General Terry Goddard filed an unprecedented suit against him on behalf of five state agencies: the Department of Environmental Quality, the Land Department, the Game and Fish Commission, the Agriculture Department and the Board of Regents on behalf of the Arizona State Museum. I don’t think we’ve ever had a case [against a developer] involving multiple agencies, Goddard says. But Arizona isn’t alone in accusing Johnson of breathtakingly bad acts. The Environmental Protection Agency is also suing him in a case that could mean tens of millions of dollars in fines and the demand that he restore the Santa Cruz River to its original state. This is a big clean water case for us, says Jessica Kao, an attorney for the EPA’s regional office in San Francisco, which monitors activity in Arizona. This type of lawsuit is not unusual, but the scope and seriousness of the case makes this stand out. What else stands out is that this isn’t the first time Arizona officials have been enraged about Johnson’s approach to development. Before he ever touched La Osa Ranch, Johnson had already made Arizona history for unsavory development with his Johnson Ranch project in the southeast Valley. For that project, Johnson received the largest fines ever imposed by two different state agencies. In 2003, the Department of Environmental Quality fined him $80,000 after finding that he had drilled three illegal wells and pumped water without any groundwater rights ­ an activity that is strictly governed and requires permits from the State of Arizona. At the same time, the Department of Water Resources fined him $90,000 for what they’ve called a massive discrepancy on the groundwater used for Johnson Ranch. Johnson is supposed to replace all the groundwater he uses at the ranch, but the reports don’t add up, and it appears he’s using far more than he’s replacing, according to the department. Company officials say the problems were simply oversights or paperwork errors and promised to fix everything. George Johnson turned down an interview request from PHOENIX magazine, but his side of the story is available on The Johnson Report, the blog he’s been keeping since 2006 (thejohnsonreport.com). In thousands of words, he rails against Arizona’s fabricated case against him and claims he is being singled out. He also believes his Johnson Report is a potent force and that it is scaring state officials into realizing they made a grave mistake in starting this fight. Johnson maintains he did nothing wrong. For instance, when accused of destroying native plants, he writes, The state is under the impression that every rancher and entity in Arizona asks permission to trim trees and clear brush on private land. When accused of blading over thousands of acres, he writes, The state is still having trouble accepting the fact that clearing pastures is standard ranching practice. And when told that Arizona has 250 witnesses ready to testify against him, he chides that the state is looking for more dirt on him and wonders why they’d need more if they already had so much. Sounds like desperation to me, he writes. Johnson originally responded to the state lawsuits by countersuing Arizona. He demanded it drop the suits and sought $33 million in damages, claiming the charges were nothing but a get George Johnson campaign. His complaint stated: The individual defendants have intentionally denied Mr. Johnson equal protection under the law by treating him as a class of one and subjecting him and his business entities to a punitive enforcement scheme not endured by other persons or entities in Arizona. The countersuit was ultimately dismissed in December as part of the settlement. So was a suit Johnson filed against Attorney General Terry Goddard and his wife Monica, claiming Goddard defamed him when he announced the lawsuit as wanton destruction of Arizona’s heritage resources. Goddard claimed he had absolute immunity from such suits in carrying out the duties of his office. The Arizona Republic’s editorial page weighed in on Johnson’s counterattack, arguing the state’s top lawyer has an absolute need to speak freely about suits he files. Johnson said in his blog that he has been mostly misunderstood. I have lived in Arizona all my life, he said in his first blog entry on July 1, 2006. I love this state as my father before me loved this great state. I have been in business here all my life and have made many contributions to this state, some of which I am proud to say bear our family name. But he bemoans that the Arizona lawsuit has left nothing but a negative impression of him. My business activities have come under scrutiny for a number of reasons, and the papers write about these events as if Atilla (sic) the Hun were let loose upon Arizona. Mention the La Osa Ranch story to anyone and you’ll find they’re speechless about the enormity of the destruction there. Some say they still can¹t believe this could have happened ­ not in this day and age, not in broad daylight, not even in a state that has a sordid history of development. For a long time, it seems Arizona developers didn’t much care how the state grew, just that it grew ­ that they could overcome an unforgiving desert and turn millions of acres of real estate into something of value. The development boom came after air-conditioning was developed around World War II. Soldiers who had trained at air bases that once book-ended the Valley made good on their vows to return if war didn¹t claim them. Construction became Arizona’s sixth C ­ joining the legendary five staples of Arizona’s economy (copper, cattle, cotton, climate and citrus) ­ and entire towns were built. Phoenix went from a small town of 48,000 in the 1930s to the nation’s fifth-largest city today. Communities throughout the state grew and grew. By the 1970s, Arizona scandalized the nation with sweeping incidents of land fraud. Thousands of investors found they hadn’t bought a piece of paradise but a chunk of raw desert without water, roads, power or the possibility of habitation. It was painfully obvious that this kind of rip-off reputation wasn’t good for business, and there was a growing outcry ­ both from outside the state and from within ­ that careless development was going to soil the sandbox for everyone. So Arizona began the serious task of passing laws and regulations ­ grading, drainage, land­use planning, hillside ordinances, water assurances, master plans ­ to overcome the negative image. Development ­ a major economic engine in the state ­ can be found in all forms today. Some developers build look-alike houses mile upon mile while some attempt to create more unique neighborhoods that attempt to stand out among the crowd. One or two are even building sterling reputations as sensitive, environmentally friendly developers. By any measure, Johnson’s La Osa Ranch ranked at the bottom of Arizona development. His land sat near the small town of Marana, just north of Tucson in southern Arizona, close to the Pinal and Pima county lines. It also was near the Ironwood Forest National Monument and the Los Robles Archaeological District ­ both protected, restricted areas meant to be kept in pristine condition. In addition, it was within striking distance of military flight patterns and helicopter training facilities of the Western Army National Guard Aviation Training Site. This open desert north of Tucson is one of the ripest spots in the state for development. A dozen massive subdivisions have been approved, promising to bring nearly 200,000 housing units with a half-million new residents to an area that’s currently considered rural. The Town of Marana pays incredible attention to all this development, watching through satellite imagery just how its land is changing. The town even employs a satellite analyst, Chris Mack, and it was he who first noticed what was going on at La Osa Ranch. As he told Government Technology magazine in 2005: We started hearing in December 2003 through various environmental groups of this proposed La Osa Ranch development and some of the allegations of illegal land clearing. I looked to see if our imagery covered the area and, at that time, we had two dates of imagery ­ May 2002 and May 2003. I spotted the site in question fairly readily because there was a start of land clearing activities, and you could see bulldozer tracks in the area of interest. By 2004, the extent of the damage could clearly be seen from space, Mack adds, and as the magazine described, the images resembled a lunar landscape or the aftermath of a nuclear blast. In the pictures he gets from space, Mack knows that vegetation shows up as red while dirt shows up as gray. In the first pictures he had, La Osa Ranch was awash in red. By 2004, there wasn’t a bit of red to be seen on the entire 2,270 acres. The land had been scraped clean of some 40,000 native plants, including thousands of state­protected saguaros, the state’s lawsuit says. The landscape of the Ironwood Forest National Monument is swathed with the rich, drought­adapted vegetation of the Sonoran Desert. The monument contains objects of scientific interest throughout its desert environment. Stands of ironwood, palo verde and saguaro blanket the mountain floor beneath the rugged mountain ranges, including the Silver Bell Mountains. The desert bighorn sheep in the monument may be the last viable population indigenous to the Tucson basin. In addition, the state notes that portions of the land are so rich archaeologically that they have been designated on the National Register of Historic Places as within the Los Robles Archaeological District. In all, this district includes 119 sites that once represented a large and successful hub of trade, manufacture, agriculture and ritual/political life of the Hohokams. While most Hohokam sites around Arizona have disappeared, this area has survived almost intact, and thus offers a unique opportunity to study all the levels and components of Hohokam community life, the state notes. When Johnson bought the land for his company, it was designated in Pinal County’s comprehensive plan as development sensitive and rural. He soon asked that its zoning be changed to transitional, and on October 15, 2003, he submitted a detailed plan for a Planned Area Development (PAD), which included 67,000 homes, a resort, golf courses and businesses. Basically, it was supposed to be a city twice the size of Flagstaff. Some saw it not as a planned community but as a sprawl city that would damage the area and eventually force the closure of the military installations nearby. When Johnson was confronted with this opposition, he argued that Pinal County would be illegally taking his property without compensation if it denied him the zoned he wanted. Not so fast, the state’s largest newspaper said, with an editorial titled, Sorry, George, That One Won’t Fly. The Arizona Republic reminded him that he didn’t have a right to new zoning. That’s why the whole procedure is called a zoning request, not a zoning guarantee, the editorial chided. None of the opposition seemed to stop Johnson, according to the state. Johnson International’s requests to Pinal County generated considerable public concern and/or opposition, the suit contends, including concerns about the impact that the proposed development may have on the adjacent Ironwood Forest National Monument, the archeological sites within the Los Robles Archeological District, the Santa Cruz River, the area’s riparian habitat, the bighorn sheep in the Silver Bell Mountains, areas of religious and cultural significance to native Americans, and endangered species such as the Pygmy Owl. Nevertheless even as Johnson International’s requests were being considered, Defendants already had bulldozers and other earth moving equipment clearing and leveling substantial portions of the proposed development, trespassing on State Trust Lands, destroying protected native plants, filing in water courses, discharging pollutants, irreparably damaging ancient and historic archeological sites, and otherwise ignoring numerous laws applicable to developers in their position. I haven’t seen a lot of George Johnson types, says attorney Mike Smith of the National Trust for Historic Preservation. He is one of the more prolific bad actors. Smith, speaking from his office in Washington, D.C., says his national group got involved in the controversy because Johnson’s land was so close to a national monument. There’s something more universal about George Johnson and what he represents, especially in an area like Arizona where there are a tremendous number of unidentified cultural resources, Smith says. It seems his approach as a developer is, he just does it and deals with the repercussions later. That usually means fines. That approach is unacceptable. It’s not uncommon for development and protected sites to clash, he notes, but there’s a way to deal with that, and that’s by acquiring permits needed to make major changes on land. Usually a developer is going through the permit process, and that’s how we discover problems, Smith says. The permits spell out the intended changes on the land, and that’s when officials can debate with developers about what’s acceptable. This case was so different because, although Smith says the law is clear that Johnson needed permits, he not only didn’t have them, he didn’t even apply for them. Johnson first contends in his reply to the state lawsuits that he didn¹t need permits to do his ranching and farming activities ­ noting this property has been ranchland for hundreds of years ­ but he also maintains the grading was a mistake by a subcontractor and not his fault. Carolyn Campbell is one of the environmental leaders of southern Arizona that sounded an alarm about George Johnson. She heads the Coalition for Sonoran Desert Protection and has worked for years to hammer out a compromise with developers in southern Arizona to respect the land. The landmark Sonoran Desert Conservation Plan, adopted in 1998, has been recognized nationally as a smart and effective way to preserve both habitat and threatened species while accommodating new development. Campbell also was instrumental in getting the federal government to create the Ironwood National Monument. It was a big deal to us getting 129,000 acres as a national monument, she notes. So she took particular interest in what Johnson was doing. It wasn’t much fun working with him, she says in a telephone interview. After seeing some of the things George Johnson did on the land, it is hard for me to see any of them as accidental. Who bulldozes a river by accident? Without a permit? Who puts in a concrete culvert by accident? How can you not know? I watched him in public meetings and how he treated everyone ­ my mouth was wide open that anybody could be that insensitive. He wouldn’t meet with us. We tried, but he dismissed any environmental concern. Campbell adds, I’ve worked with a lot of developers in Pima County. From small to big, the whole gambit. And I haven’t worked with someone like him. Maybe that’s how they grow them in Phoenix. Hopefully, I’ll not have to deal with someone like him again. Then there’s what George Johnson did to Arizona’s largest herd of bighorn sheep ­ owned by the citizens of Arizona ­ and the horrible suspicion that it wasn’t an oops mistake. The state’s lawsuit lays it out in dry, legal terms: Upon information and belief, during August­December 2003, Defendants caused between four and five thousand domestic goats to be located on the La Osa Project. At all times relevant hereto, Defendants knew or should have known that there was a herd of desert bighorn sheep that ranged in or around the Silver Bell Mountains, southwest of the La Osa range. Defendants further knew or should have known that domestic goats can directly transfer certain diseases to desert bighorn sheep. Johnson knew all of this, the suit contends, because the grazing lease he had with the state of Arizona specifically states: To protect desert bighorn sheep: No domestic sheep or goat grazing will be authorized on public lands within nine miles surrounding desert bighorn sheep habitat. The La Osa range is within nine miles of the Silver Bell Herd, the suit notes. Brian Dolan, the president of the Arizona Desert Bighorn Sheep Society, remembers a more horrifying version of what happened when George Johnson decided to raise goats on the ranch he was trying to develop into thousands of houses. He brought in several hundred diseased domestic goats from Texas and put them in a private pasture near Ironwood, Dolan recalls. He says Johnson had barbed-wire fence that was inadequate ­ it was meant for cattle, not goats. Several hundred diseased goats escaped and trespassed into lands managed by the state and federal Bureau of Land Management. They infected the bighorn with two diseases, he says. One caused temporary or permanent blindness. The other was a viral disease that creates open sores. A number of bighorns died, probably one-fourth or one third of the herd [an estimate of 75 to 100 animals overall]. I saw some pretty disturbing video of blinded sheep running head-on into saguaro cactus. It was like watching sheep commit hari-kari. Dolan says it took two months of complaining about the goats getting out of the flimsy pens before anything was done. Johnson told him he was sending out cowboys to round up the goats, but they weren¹t getting rounded up. Dolan says he regularly called the BLM, Game and Fish, and Johnson with his concerns. It was so frustrating to me, Dolan says. The whole time everybody thought it would go away. Finally, even Johnson himself realized the problem and said, go out and shoot them. It took six to eight weeks to kill all the goats. By then, the infections had set in and sheep were dying. It was just unbelievable, Dolan says. Game and Fish officials arrived in helicopters, trying to land on the rugged mountains to get vaccines to the sick bighorns. It was at great expense and a great difficulty, Dolan adds. One guy broke his hand. They had to jump out of the helicopters to get to the sheep. It was pretty difficult. In all, the state charges, despite their efforts to provide medical care, at least 49 sheep suffered serious symptoms including blindness, scabbing and bleeding of the mouth. At least 21 died from malnutrition, falling from the steep terrain or the inability to evade predators. Environmentalist Carolyn Campbell says she got very suspicious about those goats when Johnson was warned that the bighorn sheep herd near his land was an issue in considering his proposed development. She remembers this: Mr. Johnson said, Don’t worry about the bighorn sheep, they will not be an issue. What does that mean? I have to think this wasn’t a whole series of accidental oops. Dolan verbally recoils at the thought: God, I hope it wasn’t on purpose ­ that would be too diabolical. But it wouldn’t surprise me that the reason the goats were out there was not for legitimate reasons. Maybe for a tax scheme. Johnson isn’t a livestock owner, he¹s a developer. Dolan says he has never seen anything like this and hopes he never will again. This is the first time we’ve had problems with such carelessness, he says. The goats were put there in such a careless fashion, and when they escaped there was a reckless response. If it occurred again, I’d be more tenacious in demanding a more expedient response. Dolan had already been deposed and was ready to testify had the state’s lawsuits gone to trial. He says he’ll always remember this as a real mess. Also ready to take the stand ­ in fact, the first witnesses the attorney general’s office intended to call ­ was Bruce Babbitt, the former governor of Arizona and a former secretary of the interior. He counts getting the National Monument status for Ironwood as one of his proudest achievements. Meanwhile, Johnson was denied his rezoning request on La Osa Ranch and has since sold the land. The civil suit didn’t seek a specific amount of damages but asked the court to impose fines as required by law ­ sometimes seeking triple damages and punitive damages. For the water-quality issues alone, the state was asking for $25,000 per day for violations that spanned a couple of years. The suit had gotten strong editorial support from The Republic. We hope the state prevails and that the final tab is hefty, it said in a February 20, 2005 editorial. Not just to penalize Johnson and his associates, although the actions described in the lawsuit richly deserve punishment. But in a state where growth is king, this legal action sends an important message that developers can¹t flout the rules without consequence. They can’t write off environmental damage as a cost of doing business. And they can’t violate our heritage. Now, in an entirely separate situation, the Environmental Protection Agency (EPA) wants tens of millions of dollars from Johnson. In November 2005, it filed a massive suit charging that Johnson and two of his companies violated the federal Clean Water Act by filling more than 100 acres of the Santa Cruz River and its tributaries with dirt and debris during 2003 and 2004. The EPA says he stripped stretches of the riverfront, including one of the river’s last mesquite bosquets in one of the Sonoran Desert’s wettest riparian forests. It was devastating destruction, the agency says, so it sued to force Johnson not only to restore the area ­ a job that would cost millions ­ but also fined him up to $32,500 for every day the law was broken and the damage lasted. If the courts find a single violation that lasted a year, the fine would top $10 million. But the EPA is not charging there was just one violation. Its officials tallied violations for each time a bulldozer dumped dirt in the river. They say the damage could have spanned nearly two years. Johnson has called the suit baseless and denies the claims, saying whatever grading was done was in an isolated wash, not in the river or a tributary. He also contends the wash fails to meet federal standards as a navigable stream that would bring it under the reaches of the Clean Water Act. A prepared statement in response to the suit reads: It is preposterous to say that a small wash in the middle of the Sonoran Desert is a navigable water. Kao, the EPA attorney in San Francisco, says the suit is in the discovery stage and no court date has been set as of press time. It could be years before the case ever gets to court. These days, the land called La Osa Ranch lies silent, looking like a swath of dirt from outer space. Native grasses and plants are attempting to grow back along the Santa Cruz River, as desert plants have done for centuries in a climate where weaker varieties wouldn’t even try. Will the record $12.05 million settlement against Johnson alert other developers that the State of Arizona is serious about reining in outrageous behavior and protecting its land? Terry Goddard would tell you he certainly hopes so.